The third week in the 2018 Six Nations championship saw a clash between the only unbeaten teams left in the tournament, England, the leaders and Wales, who sat in second place after their victory in Rome two weeks earlier. This game promised to be colossal with one of the teams Grand Slam hopes coming to an end while the other would continue their winning streak. Every year this matchup is tightly fought with the result often coming down to a bounce of the ball or penalty kick, but the Welsh players had the added incentive as they attempted to beat the record for most consecutive games won by Wales. The atmosphere in Cardiff was immense all day for the first of Wales home games this championship but the home advantage didn’t seem to benefit the Welshmen as the English scored first through an Owen Farrell penalty in the 18th minute. Wales did respond quickly however, Gareth Anscombe kicking a penalty of his own 6 minutes later, only to concede a try within 3 minutes as Tom Curry showed impressive instinct to spot a gap in the usually well organised Wales defence and break through it after picking up the ball from the base of a ruck. After regaining the lead, the Englishmen looked confident for the remainder of the first-half but missed some good opportunities. In the 39th minute Jonny May booted the ball down field and then drove Haleigh Parkes into touch after he recovered the ball ten metres from the Welsh try line but the English the failed to gain any points, despite their good field position and pressure. The score at the end of the first-half was 3-10, in favour of the English but a 7-point advantage is by no means insurmountable and they likely would have benefitted from gaining something just before half-time to further the pressure already on the Welsh. The second-half was much more positive from a Welsh perspective, initially chipping away at England’s lead with a further two penalties to fight back to within 1 point. Farrell did kick another penalty for England to make the score 9-13 just after the substitution of Dan Biggar, which marked a real turning point in the game. In the 67th minute a miss pass from Biggar to George North got the Welshmen within metres of the English try line, before he acted as scrumhalf popping the ball up to Cory Hill who crashed over the line for Wales’ first try and to give them the lead for the first time in the game. However, as many Welsh fans will tell you a three-point advantage, which Wales now had, doesn’t mean you have secured a win, even in the last moments of the game, with Wales losing many games in such circumstances after conceding in the dying moments of the game. This is likely why the Principality stadium erupted into cheers as Josh Adams caught an inch perfect cross-field kick by Dan Biggar five meters from the English line and despite a small fumble in the air managed to control the ball and scramble over for another Welsh try. 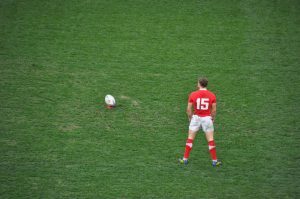 Despite Biggar uncharacteristically missing the conversion, this meant that Wales had an 8-point lead in the last minutes of the game and couldn’t realistically be caught out by a last-minute stunner as they have so often before. Wales regained the English restart and then retained the ball until the clock ticked over to the 80-minute mark and was booted off the pitch by Aled Davies to end the match, 21-13 to Wales. As mentioned previously, this gave Wales a record 12th win in a row, more than any Wales team has managed before. This is very positive leading into a World Cup later this year but they must keep their eyes on the ball against both Scotland away at Murrayfield and Ireland back in Cardiff if they want to see themselves crowned champions and Grand-Slam winners on the 16th of March. In contrast, English fans will be hoping that either the Scots or the Irish will be able to defeat the Welsh in the following games, as they back themselves to beat Italy and Scotland at Twickenham and that the bonus points, they have already attained will see them finish atop the table come March. Elsewhere this weekend, France bounced back from their previous defeats to Wales and England, with a bonus point win versus Scotland in Paris. A convincing 27-10 point victory meant that the scots haven’t won in Paris for 20 years despite having a man advantage after Yoann Huget was sent to the sin-bin for 10 minutes for repeated infringements mid-way through the first-half. The French could easily have scored even more against the Scots on the day after having a number of tries disallowed for knock-ons in the build-up but they still managed to get that all important bonus point to put themselves above Scotland in the table. It was a typically French display, one with plenty of flair and skill, which looked far more assured than the Frenchmen’s previous game against England. The Backs in particular played in a much more open style than we have seen from France in the last few years with Huget providing some scintillating runs, Gael Fickou providing good linkup play and nearly scoring himself while Mathieu Bastareaud put in a lovely chip that I don’t think anybody saw coming from the usually direct centre. Substitute Gregory Alldritt also impressed scoring two tries, including the all important 4th, which came 7-minutes into overtime following excellent discipline by Les Tricolores. Sunday featured a game between Italy and Ireland in Rome, a game in which man expected Ireland to dominate despite their recent drop in form and Italy performing well for parts of the opening game against Scotland and the game against Wales. The Azzurri certainly took most people by surprise, scoring twice in the first-half to give themselves a 16-12-point lead going into the break. Ireland were lucky to have 12 points going in at half time with a second try coming from the prolific Jacob Stockdale who picked up a fumbled ball from an Irish restart and tore his way through the Italian defence to give his side a 9-point advantage in the 21st minute. This lead was chipped away by the Italians, whose two tries came in the latter parts of the first-half, showed they are developing into a top-tier rugby nation. Unfortunately for the Italians, they were unable to retain this lead and ultimately lost again, although the 16-26 score somewhat masks the flaws of the Irish team who looked off the mark again despite getting a bonus point for scoring 4 tries. I believe there were some questionable refereeing decisions and that the discrepancy in the number of penalties conceded isn’t a fair reflection of the two sides’ discipline. Overall, I was impressed with the Italian performance but there was only going to be one winner in this match-up. That being said Ireland have seen a drop in form recently and could struggle to regain it in their remaining matches. This is the 20th year that the Italians have been playing in the Six nations and I believe that having been exposed to the sport from a young age, many young players will be brought into the Italian squad in the coming years and we will start to see them becoming much more consistent than they have previously been and we may well see them start to place higher in the Six Nations table. I also think that the score in this game also helps to put the Welsh performance in Rome in perspective, as the Welshmen managed to win by a greater margin despite making 10-changes to their starting line-up, while the Irish team contained a far greater number of first team players who are likely to appear in their remaining games against France and Wales. These results leave Wales in 1st, although England have 2 more bonus points and are breathing down their necks. Ireland sit in 3rd place with 9 points, but can be overtaken by France who are 4th in their next game on the 10th of march should Les Bleus defeat the Irishmen in Dublin. Finally, Scotland sit in 5th place with only one recorded victory over bottom placed Italy who will likely lose all of their games once again.